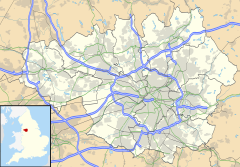 Longsight is an inner city area of Manchester, England, 3 miles (4.8 km) south of the city centre, bounded by Ardwick and West Gorton to the north, Belle Vue to the east, Levenshulme to the south, and Chorlton-on-Medlock, Victoria Park and Fallowfield to the west. Historically in Lancashire, it had a population of 15,429 at the 2011 census. Longsight is an ethnically diverse area, with high levels of poverty, deprivation and crimes. For many years, Longsight has been plagued by gang related violence, similar to that of nearby Moss Side. Most of the violence came from tensions between two rival gangs which fought "turf wars" with each other since the 1990s, resulting in many shootings and several deaths. The Gooch Gang, from neighbouring Moss Side, were jailed in 2009, Consequently, gun crime in Greater Manchester as a whole has fallen dramatically, from a high of 120 gang-related shootings in 2006 to just 16 in 2011. Longsight electoral ward within Manchester City Council. Longsight has been in the parliamentary constituency of Manchester Gorton since boundary changes in 1983. The seat has been represented in Westminster by Afzal Khan since June 2017. The area is represented on Manchester City Council by three councillors, currently Abid Chohan, Luthfur Rahman and Suzanne Richards. Abid Chohan was initially a Lib Dem councillor but defected to Labour ahead of the local council elections in 2010.
indicates seat up for re-election. indicates councillor defected. Previously known as Grindlow Marsh, it was incorporated into the City of Manchester in 1890. The district is bordered by Ardwick to the north, Rusholme to the west, Levenshulme to the south, and Gorton to the east. Longsight is currently defined by Hyde Road, Grey Street, Stockport Road, Plymouth Grove, Daisy Bank Road, Pine Grove, Merwood Grove, Ash Grove, Longford Pl, Ayton Grove, Laindon Rd, Curzon Ave, Richmond Grove, Hathersage Road, Anson Road, Dickenson Road, Beresford Road, Old Hall Lane, Stockport Road, East Road, Pink Bank Lane, Nutsford Vale, Buckley Road and Mount Road. The old Roman road to Buxton (the A6, Stockport Road) roughly bisects the area. Longsight has a very ethnically diverse population. According to the 2011 UK census, 72.9% of the population is from non-white ethnic groups, a 20% increase over the 2001 figure of 52.7%. This includes 55.3% who describe themselves as Asian or Asian British (including 35.7% Pakistani, 11.4% Bangladeshi); and 9.7% Black or Black British. The largest religious group is Muslim with 53.8% of the population, compared with the 2001 figure of 34.7% Muslim and 38.6% Christian. Only 7.0% of the population declined to state a religion, with 12.7% stating no religion. The census tended to underestimate immigrant communities, and it is likely that these groups in Longsight were underestimated are now proportionately larger. [needs update] There are a number of Places of Worship in the area, including a large Pakistani community centre, a Jain temple, the Russian Orthodox Church of the Pokrov, Saint Agnes' Church, Bethshan International Church and The British Conference of The Church of God (Seventh Day). The main shopping centre is near the corner of Stockport Road and Dickenson Road, and contains a library and supermarkets as well as many smaller shops. Longsight Market, one of the busiest markets in the North West of England, is located on Dickenson Road. It can be easily spotted by its brightly coloured profiled roofs. The market hosts a general market every Wednesday, Friday and Saturday and a second-hand market every Tuesday and Thursday. There are a large number of takeaway food shops and restaurants and a very wide variety of fresh fruit and vegetables and other supplies to cater for the interests of the various immigrant communities in the area. The area of Longsight contains many of the notable buildings of Victoria Park. Daisy Bank Road is a particularly good example, featuring Edgar Wood's Grade I listed First Church of Christ, Scientist and the Edwardian art nouveau Chadlington House, as well as the residences of Charles Hallé and Emmeline Pankhurst. Pankhurst's family house is also situated on the edge of Longsight at Plymouth Grove. Larger Victorian period properties are predominantly clustered around the leafy western parts of Longsight, an area informally known as Westpoint. Many grand Victorian villas can also be found overlooking Crowcroft Park in the most southern part of Longsight. Situated on Stockport Road near the main market of Longsight is Longsight Library. Run by Manchester City Council, it provides services such as borrowing books, adult education services and a child homework centre. Great measures have been taken to make the architectural view of new Longsight Library building aesthetically pleasing. The Apollo Theatre, Longsight Market, Noman Newsagents, Crowcroft Park and new Longsight Library are the important places in the Longsight area. Train: The railway line from Manchester to Stockport — the West Coast Main Line passes through the area, though Longsight railway station closed in 1958. The nearest stations are now at Ardwick and Levenshulme. Longsight is the site of Longsight Electric TMD and Longsight Diesel TMD which service trains for Virgin Trains, Northern and TransPennine Express. A plan to house Eurostar trains at Manchester International Depot was abandoned. The earliest railway works was set up in 1842 by the Manchester and Birmingham Railway (M&BR). Little is known about its early history, except that it produced fifteen single wheeler passenger engines to a design by Sharp Stewart and Company. In 1846 the M&BR was amalgamated with the London and North Western Railway (LNWR) under John Ramsbottom. One 0-6-0 was produced in 1858 but then the works closed down as the LNWR transferred its operations to Crewe. The Longsight steam locomotive depot provided engines for express trains to London and elsewhere, and for local passenger trains. Bus: Bus route 192, according to Stagecoach Manchester, is the busiest in Britain, with around 9 million passengers carried annually. The bus runs every 5–10 minutes daily until the late hours. 3 Addison Terrace, on the north side of Daisy Bank Road, Victoria Park, was the home of Charles Hallé, the founder of the Hallé Orchestra, in 1848. The pre-raphaelite artist Ford Madox Brown lived at the same address from 1883 to 1887. Edwin Chadwick – a social reformer and liberal politician – was born in Longsight. He was later partially responsible for the 1848 Public Health Act and then the succeeding 1875 Public Health Act. The Wetherspoons pub in the area was named the 'Sir Edwin Chadwick', but was closed within three years, after custom failed to live up to expectations. John Thaw, the television, stage and cinema actor, was born in Longsight in 1942. Ethel 'Sunny' Lowry, the first British woman to swim the English Channel, was born in Longsight in 1911. The Arsenal player Danny Welbeck and Kerala Blasters player Wes Brown are both from the area. Harry Potter star Afshan Azad was also born in Longsight. Keith Bennett, one of the Moors murders victims, was from Longsight. He was 12 years old when he disappeared on his way from his house to that of his grandmother on 16 June 1964. His disappearance was reported to police the following morning, but in spite of endless police searches he was not found. 22 years later, in November 1986, Moors murderers Ian Brady (who had also lived in Longsight when he was younger) and Myra Hindley revealed that he was one of their victims; just as police had first suspected after arresting them for three other murders in October 1965. Despite numerous searches for his body on Saddleworth Moor, it has yet to be found. His mother Winnie Johnson continued to live locally until her death in August 2012, and made constant calls in the media for help to locate her son's body. Menelik Watson is an American football offensive tackle for the Denver Broncos of the National Football League (NFL). He was drafted by the Oakland Raiders in the second round of the 2013 NFL Draft. He played college football at Florida State. Oasis members Liam and Noel Gallagher were born in Longsight, but later moved to Burnage. Adam Kenny is a Music Producer based in Longsight, making a career in the industry through his frantic drumming style in the electro pop band ‘Crimsons’ and his use of abstract recording techniques. Faisal Islam of Sky News grew up in Longsight and attended the local private school. Longsight was immortalised in song by local singer Ian Brown formerly of the Stone Roses on his album Solarized. The song was titled "Longsight M13" reflecting the postcode of the area, which begins with M13. Graffiti appeared locally saying 'Stone Roses RIP' when the band split up, and 'Free Ian Brown' when he was jailed. The song was written with Brown's former bandmate, guitarist Aziz Ibrahim, who still lives in Longsight. Brown also mentions the area in the Stone Roses song "Daybreak" which contains the line "From Atlanta, Georgia, to Longsight, Manchester". ^ Thompson, Tony (28 July 2002). "Gang warfare in Games city". The Observer. London. Retrieved 26 November 2007. ^ "Gooch Gang members will be sentenced for bringing 'murder and mayhem' to Manchester". The Telegraph. 7 April 2009. Retrieved 21 August 2012. ^ "Manchester gang-related shootings decline". BBC News. 22 December 2011. Retrieved 21 August 2012. ^ "Afzal Khan MP". parliament.uk. UK Parliament. Retrieved 3 February 2018. ^ "Abid Chohan". manchester.gov.uk. Manchester City Council. Retrieved 24 May 2018. ^ "Luthfur Rahman". manchester.gov.uk. Manchester City Council. Retrieved 24 May 2018. ^ "Suzanne Richards". manchester.gov.uk. Manchester City Council. Retrieved 24 May 2018. ^ a b Staff writer (18 April 2010). "Lib Dem councillor defects to Labour Party". Manchester Evening News. Trinity Mirror. Retrieved 23 March 2017. ^ "Central Manchester: Background Information and Ethnic Profile". Race for Health. Archived from the original on 12 March 2007. Retrieved 14 May 2006. ^ a b c "Ethnic Group, 2011; Area: Longsight (Ward)". Neighbourhood.statistics.gov.uk. 30 January 2013. Retrieved 13 March 2013. ^ a b "Ethnic Group, 2001; Area: Longsight (Ward)". Neighbourhood.statistics.gov.uk. 9 November 2004. Retrieved 13 March 2013. ^ a b "Religion, 2011; Area: Longsight (Ward)". Neighbourhood.statistics.gov.uk. 30 January 2013. Retrieved 13 March 2013. ^ "Religion, 2001; Area: Longsight (Ward)". Neighbourhood.statistics.gov.uk. 18 November 2004. Retrieved 13 March 2013. ^ "Manchester Health Finance (Census Data)". UK Parliament. 25 February 2005. ^ "The Belle Vue Archive". Our Manchester. Retrieved 15 November 2007. ^ "Pubs of Manchester: Sir Edwin Chadwick, Stockport Road". Pubs of Manchester. Retrieved 30 May 2017. ^ "Sunny Lowry's Story". Victoria Baths. 22 May 2008. Archived from the original on 17 December 2007. Retrieved 15 November 2007. ^ "Swimming the Channel: Between the wars". Dover Museum. Archived from the original on 30 September 2008. Retrieved 15 November 2007. ^ Sadler, David. "David Sadler: Longsight lad Danny Welbeck shows Carlos Tevez how it should be done", Manchester Evening News, 29 September 2011. Accessed 3 September 2013. ^ "The making of Wes Brown", The Independent, 25 October 2008. Accessed 3 September 2013. ^ Deborah Haile (13 February 2006). "Student off to Hogwarts - again". Manchester Evening News. Retrieved 22 January 2012. ^ "Aziz Ibrahim's Biography". Aziz Ibrahim. Archived from the original on 23 January 2010. Retrieved 15 November 2007. This page was last edited on 11 March 2019, at 08:46 (UTC).